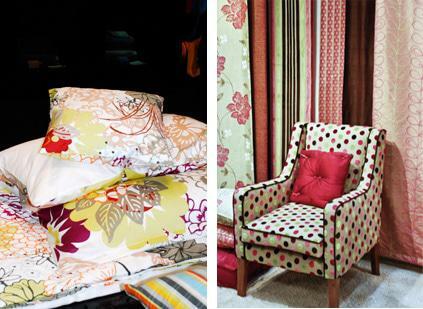 Every year Heimtextil trade show presents all the latest in textile design. It is often easy to distinguish the trends and to define in what movement direction the consumer is moving. However, this year (presenting Fall/Winter 08/09) there were over 2,800 exhibitors so to identify the trends was not as easy. Here are a few of my favourite textiles (grouped into three trends I could fathom) from the show. Nature: There is a move towards the more graphic art and nature drawings. It is the elements that are most important. Take for example, an ordinary tree trunk and fragment the colours inside into a formulated pattern (refer to the top right image). Gold is another big trend when mixed with rich red or royal purple (see the third image from the right on the top). Black and white is another movement (refer to the last image) you can see the influence of traditional hand-crocheting techniques in the flowers. My favourite in this collection must be the bugs and stem textile design (second image on the top). I do not know what the significance of the bugs having numbers in them is but the simplistic nature of the design and basic use of red and black appeals to me. Animals: I could not help but include these four textiles. The first one with the chicken and eggs I think is adorable and so fun. I can image this fabric as a cushion on a wooden bench outside a farmyard kitchen. Animals in textiles, as trend, can be either abstract and simplified or perfect and detailed like in the third textile of Squirrels and Deer. In this example I think it is important to focus on the theme more so than the design as a trend – the deers and squirrels are both cute and gentle creatures often used in fantasty stories. Fantasy and beauty are two big trends of the summer, more prevalent in fashion with the return of fairy dresses and the use of light airy fabrics. In the fourth textile below the deer is used again reinforcing this use of magic and symbolic power. The drawing of this textile is also very stylized and sketchy. This sketched quality has been around as a trend for some time now but I also do not think it is going away. I love it. I also think the unusual combination of elements in this design makes it special and even more interesting. Combinations: Colour, colour and colour. Colours are in but it is the shade and hue that matters most! Look at the cushions by Mexx Bed and Bath (right) and you can get an idea of the colour combination and how prints are overlapped, combined and co-ordinated. Put spots with stripes or plains and suddenly it is not so overpowering, but once again, it is the colour combination that is most important. This chair by Globaltex Ltd has a purple, red, pink and lime green spot. It sounds a yuck colour combination but because the shades are right, it works wonderfully and looks delicious. Most importantlly for Fall/Winter 08/09 is to have fun, combine your black and white sketch textiles with your brights (that are in the right shade) and create a house full of wonder! This entry was posted in Blog and tagged Bruckert Creations, Colour, Fabric, Globaltex Ltd, Hemitextil, Interior Trend, JAB Josef Anstoetz KG, Joaquin Reina, Mexx, Plage SA, Prestigious Textiles, Print Forum, Rasch Textile GmbH, Sprugel Hometex, Stromma Sweden, Textile Design Trends, Trends. I love that polka dot chair! My husband might object but it is so cute! You have really given the trends in very different perspective. 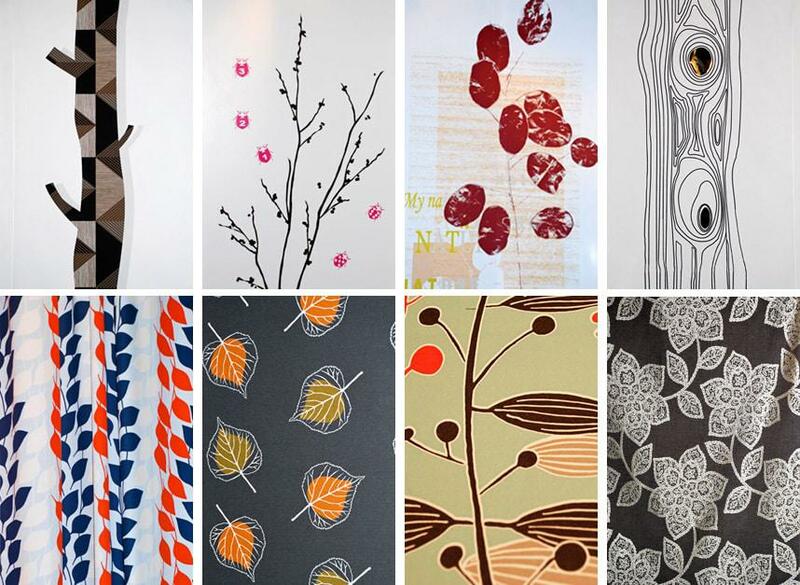 I love the samples of current textile trends that you have posted here…I was wondering if you could give me some suggestions as to where one could actually buy fabrics like these….I have been searching for some large format graphic fabrics for awhile now, and besides IKEA, I have not been able to actually locate a seller for these kinds of designs. Any help would be most appreciated! I am open to almost any design as long as it is bold and can be appreciated from several meters away.